Flavor Text: He worked the graveyard shift, because no one else would. After a while, he grew to like it. Agency night tech? Doesn't feel right somehow. Great effect so this card could go into a day deck as a worst case scenario draw, but somehow I don't see that being optimal. At cost 3 I think its too much for most decks, you'd really have to want night in the deck and yet still want agency to join it. Furthermore you can't play events that buff a single character of yours. Maybe in a Yog Tesla deck to help protect Tesla? 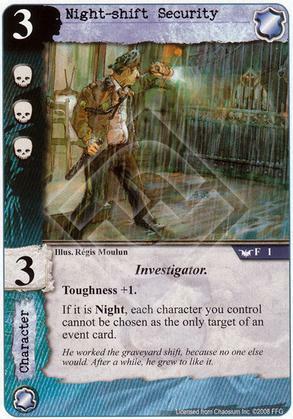 The only night time buff that agency have, he may have made a investigator deck due to CCC and toughness where some cost reduction would make him worthwhile. Alternatively he may have a place in a cthulhu agency deck that uses khopesh and night. For most agency decks he is just too costly for what he does. If you can reliably make it Night, the ability here is a beast. It's not a faction-specific protection like most similar effects. There's some possible synergy running around with Investigator. If you can't rely on the ability, though, he's easily outclassed by other 3-drops. It's also difficult to make the most out of the ability and the subtype in the same deck.